Preheat oven to 180 C/ 350F. Combine thawed blueberries, orange juice, cinnamon, ginger and vanilla in a bowl. Make a light incision around the circumference of each apple so the skin doesn’t split and the apples explode in the oven. 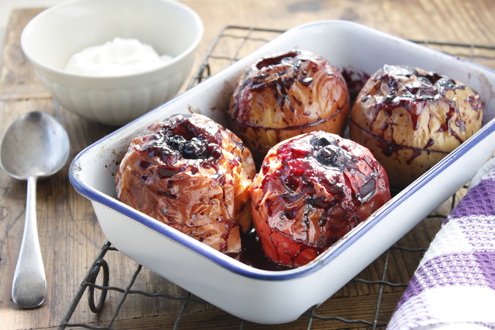 Place the apples into a lightly oiled ovenproof dish and spoon the blueberry mixture into the cored centre of each apple. Push it in gently with a spoon until all mixture has been used up. Bake in the oven until apples are soft when skewered (approximately 35 – 40 mins). As they bake, the juice will dribble out into the dish. Periodically, carefully spoon a little over the top of each apple so they don’t dry out. Serve each apple with a dollop of natural unsweetened yoghurt.